Full Custom Development/ User Interface | Socionext Inc.
To achieve the best performance of your SoC, we have full custom development option that allows you to customize as you like. For your full custom SoC development, we fully support for 1. proposing system architecture, 2. providing subsystem and a various of IPs, 3. optimized CPU peripheral design, and 4. system verification by hardware emulator and FPGA prototype. We also provide a device driver development service under contract as part of our software development support. Socionext provides the three types of basic design interface shown below. The optimal combination of customers‘ design assets and our design technologies improves the efficiency of SoC development projects. We also provide a design flow that incorporates upstream verification and FPGA prototyping, supporting ever higher-quality projects and shorter development periods. 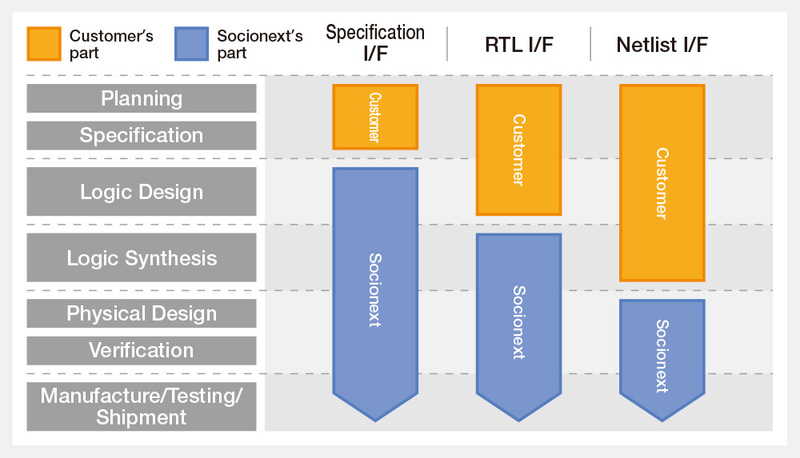 The specification interface method is used to interface with the customer based on the SoC design specifications. The customer will prepare a design specification document for the SoC to be developed. We will create an SoC development specification document based on those specifications, verify the logic design, and take care of everything right through to delivery of the SoC. The interface RTL method is used to interface with the customer based on design data (RTL) created by the customer through functional design. The customer will perform functional design through to verifying RTL. We will examine the test specifications, build a test circuit, and manage all processes through to SoC delivery. The netlist interface method is used to interface with the customer based on a netlist composed of our cells. The customer will perform tasks up to logic synthesis for netlist creation.